Secret of the Stones continues to be one of Net Entertainment’s most popular game titles, and it’s become somewhat of a cult-following, with many live streamers enjoying thousands of viewers, all submitting their “picks” for the bonus-round, where you select from various stones to win free-spins, multipliers, and wilds. 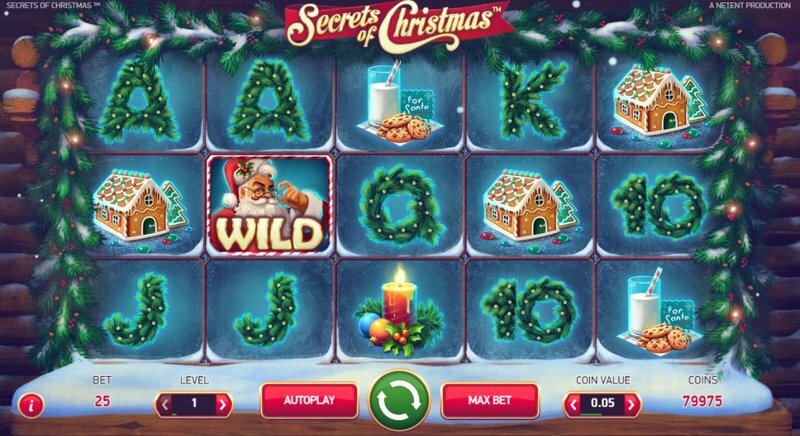 Due to the success of Secret of the Stones, it wasn’t long before Net Entertainment decided to release a follow-up to the game, and rather than simply edit the original, they went for a totally new, unique, and (already) popular approach: Secrets of Christmas. Secrets of Christmas is a summer-themed game, that takes place on a relaxing beach in Hawaii. Ok, just kidding – it’s (of course), filled with Christmassy, snowy-themed icons, and everything from the music, the jingles each symbol makes, to the reel’s symbols themselves is designed to be as festive as possible, getting players in the mood for the festive seasons, no matter what time of year it is. The reels are comprised of two types of symbols; first, you have the low-paying symbols, which take the form of traditional playing card symbols, including 10, J (Jack), Q (Queen), K (King), and A (Ace) – however, Net Entertainment have really tried hard to make the low-paying symbols a little more ‘joyous’, and in Secrets of Christmas, the playing-card symbols are designed out of wreaths, wrapped with small, yet well-lit fairly lights. The high-paying symbols include a Stocking, a Candle, a Gingerbread House, Cookies and Milk, a Golden Bell, as well as Father Christmas, who acts as the Wild Symbol within the game. Secrets of Christmas is also fully mobile-optimized, allowing players on phones, and tablets to enjoy the Christmassy game from their bed… the sofa… even the Christmas Eve Church service, if they’re really daring. Free Spins – You can win either 2, 3, 5, or 10 spins. Wild Bell – The Bell symbol will substitute as a Wild Symbol for the duration of the free-spins. Wild Candle – The Candle symbol will substitute as a Wild Symbol for the duration of the free-spins. Multipliers – You can pick a 1X, and 2X multiplier, which is added onto before the free-spins begin, and is subjected on every win. Wild Reel 2 – The entire second reel will be wild for the duration of the free-spins. Wild Reel 4 – The entire fourth reel will be wild for the duration of the free-spins. Of course, the dream setup is Wild Reel 2, 4, and one of the other wilds, yet even one wild symbol – be it a Wild Reel, or just a Wild Symbol, can lead to BIG wins, fairly easily!